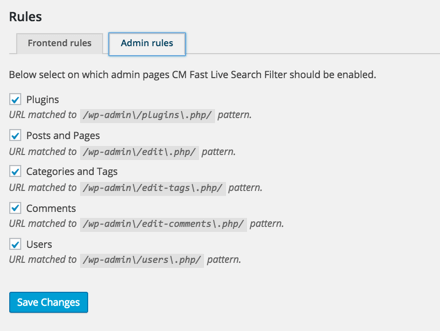 Our WordPress Live Search Filter plugin allows you to easily add a live search to your admin dashboard and to selected posts. 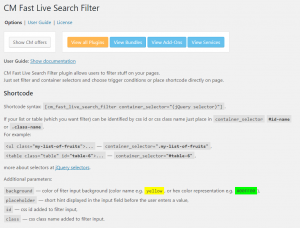 The Fast Live Search Filter plugin allows you to add a fast live search filter to elements on both the front end and the backend of your WordPress site..
Watch our search filter plugin tutorial. 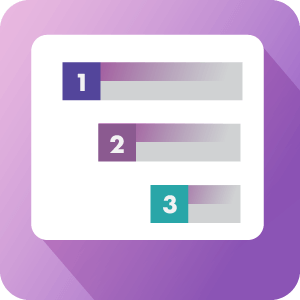 This will allow you to search within the specific admin page you’re in, and see the results narrowing down as you type your search query. When building your html table (table tag) or list (ul tags), add a class name to the container. Then, copy the plugin shortcode to the top of the page and insert the same container class into the shortcode “container selector” parameter. 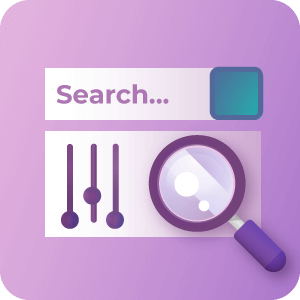 The fast search bar will be added to the top of the page or post and when typing your query, lists and tables will be narrowed down accordingly. If your HTML List tag (UL) has the following class: class="my-list-of-fruits", then you need to define the shortcode to have the container_selector=".my-list-of-fruits"
In case your HTML Table tag (TABLE) ID is: id="table-6", define the shortcode to have the container_selector="#table-6"
Under options->Rules, add a new rule by inserting the class or id, and specify the page or URL where you want to insert the filter. 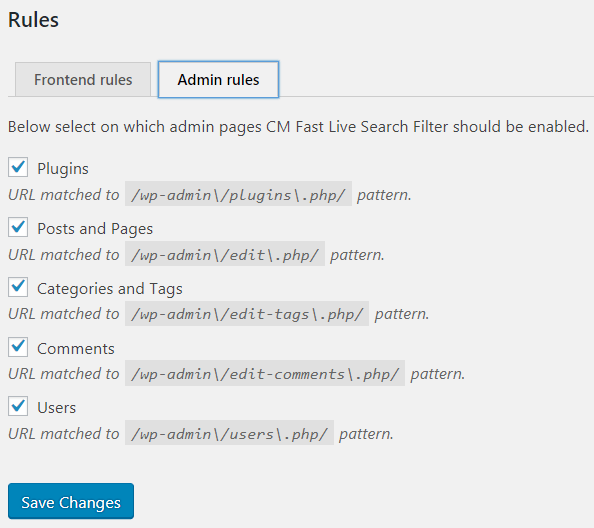 The fast search bar will be added to the page automatically, allowing to filter items within lists and pages. 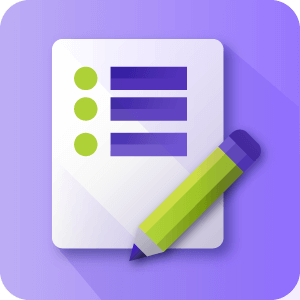 Can I apply the fast search tool to elements like lists that are created by other plugins automatically? Yes you can, the best way to do this would be to find out the class name of the element that you would like to apply the filter to using the page inspector, then to enter that class name and the URL of the page that it appears on into the Plugin Front-end rules. To learn more about how this works see our Help article on targeting existing pages. 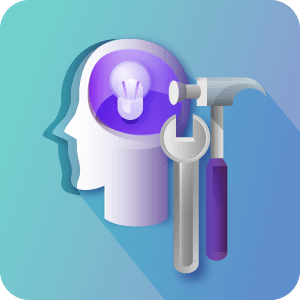 Does this plugin work on the front-end or back-end? Both. The Live filter plugin is capable of affecting both information on the front-end of the site as well as within the admin panel. Does the plugin only work by selecting classes or can it use ID's? 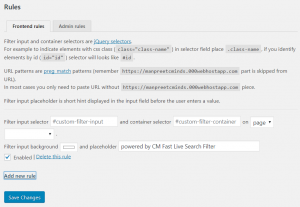 Our Live Search plugin is capable of selecting the element you wish to filter by class OR by ID. You need to enter either the Class or the ID of the input selector, the Class or ID of the container selector (i.e. that of the list or table) and the URL that the element appears on. Is it possible to change the appearance of the Search box? 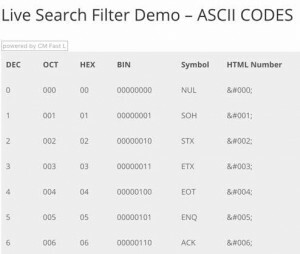 We have included a parameter for changing the background color of the search / filter box that allows you to use HTML recognized colors or hexadecimal color codes to change the color. Going further than this you would need to edit the CSS that of the search box. 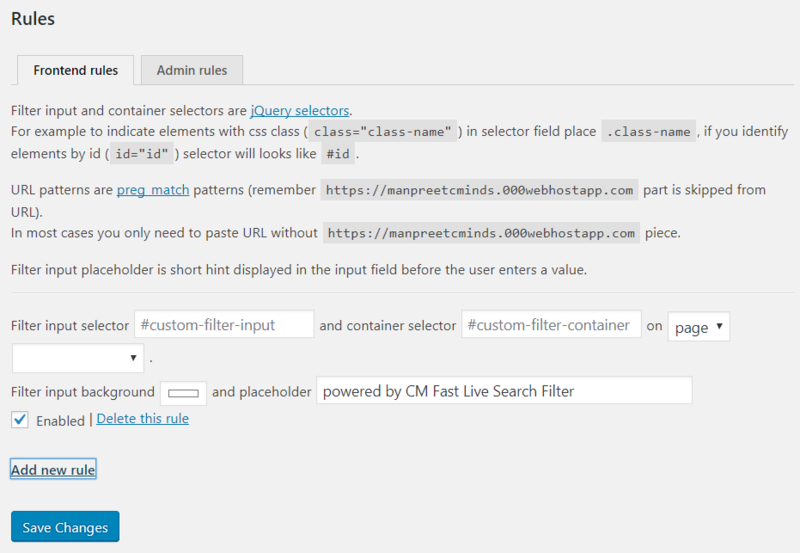 This can be aided by the parameter we have added to the filter input for adding an ID or a Class through the shortcode. 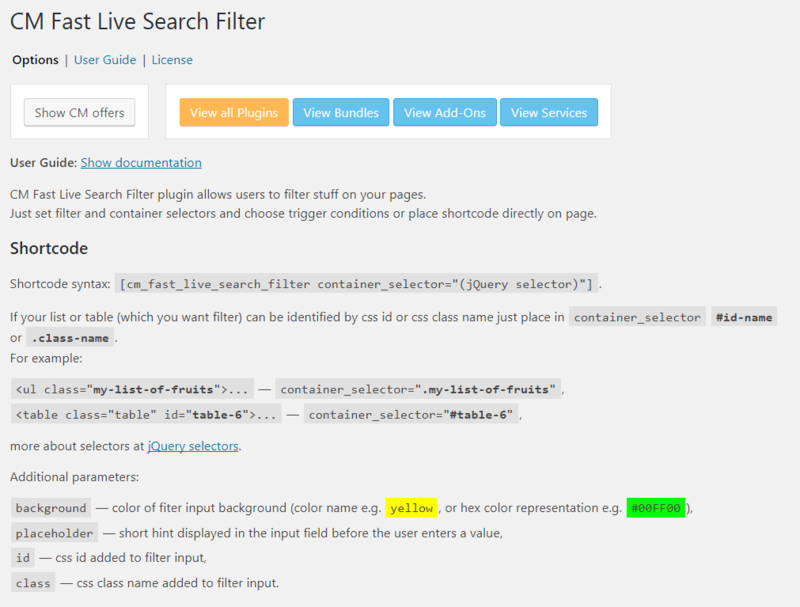 To learn more about Additional parameters for the Live Search shortcode see this Help article.